Looking for that perfect beer to have with your boo on Valentine’s Day? Stone Brewing has got what you need. 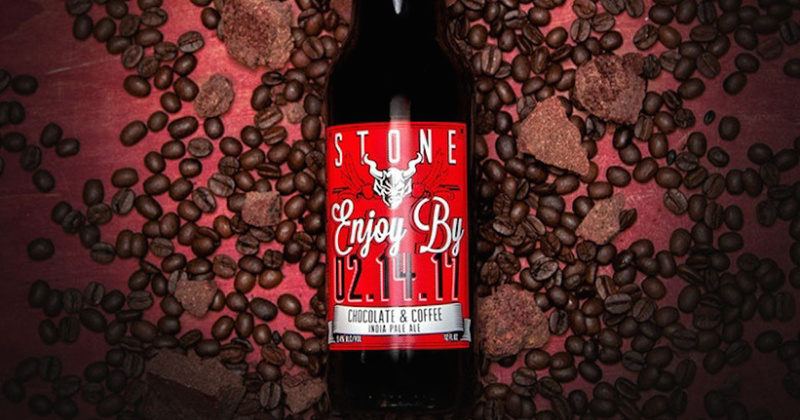 Enjoy By 02.14.17 is the next beer in Stone Brewing’s line of “Enjoy By” beers. This series gives distributors and drinkers a time frame to ship, purchase and drink them. Enjoy By 02.14.17 is a coffee and chocolate IPA that is made specifically for this up coming Valentine’s Day. The Stone brewing team tested several batches of fruit and chocolate beers before finding the right blend of hops, chocolate and and coffee. The coffee is San Diego Sunrise, a blonde roast by Ryan Bros. Coffee. This particular roast is less on the roast and more on the chocolate flavor. The cocoa beans were carefully sourced from Belize, and shelled roasted and shelled by the team. Enjoy by 02.14.17 will be available on draft and in 12 and 22 ounce bottles. For more information, check out Stone Brewing’s official website.